Hetman of the Cossacks on both sides of the Dnieper; born in South Russia in 1658; died Dec. 15, 1734. When Catherine I. expelled the Jews from the Ukraine (Little Russia) and from other parts of the Russian empire, May 7, 1727, Apostol was the first one to apply to the senate to modify the harsh law. The Cossacks, who eighty years before had massacred in the most cruel manner many hundred thousands of Jews in the Ukraine, Volhynia, Podolia, Poland, and Lithuania, and who under the leadership of Chmielnitzky had used their best endeavors to keep the Jews out of their country, had found out by this time that they could not get along very well without Jewish merchants, who were indispensable for the mediation of commerce between the Ukraine and the Polish and Lithuanian provinces. 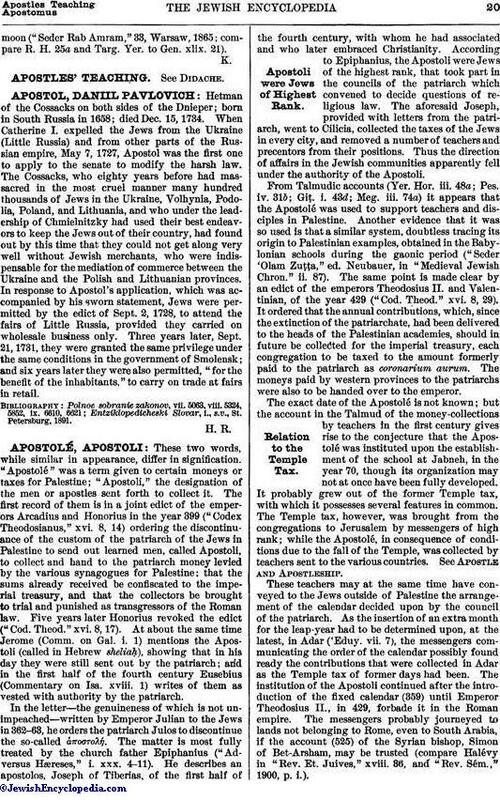 In response to Apostol's application, which was accompanied by his sworn statement, Jews were permitted by the edict of Sept. 2, 1728, to attend the fairs of Little Russia, provided they carried on wholesale business only. Three years later, Sept. 21, 1731, they were granted the same privilege under the same conditions in the government of Smolensk; and six years later they were also permitted, "for the benefit of the inhabitants," to carry on trade at fairs in retail. Entziklopedicheski Slovar, i., s.v., St. Petersburg, 1891.